The number one enemy of automatic transmissions is heat. Nothing will destroy an automatic transmission faster than allowing it to overheat. To help reduce that heat, nearly every automatic transmission has a transmission cooler, usually mounted in one of the radiator tanks. Hot transmission fluid flows into the transmission cooler, where it's surrounded by coolant. That heat is absorbed by the coolant, where it'll eventually be released to the air passing over the radiator fins. The cooled transmission fluid then returns to the transmission to keep the transmission operating at a safe temperature. On most cars, that factory cooler provides enough heat transfer to protect the transmission. But over time those coolers can plug or crush, restricting flow and reducing the amount of heat it can release. On other vehicles, the load placed on the transmission ends up generating more heat than the factory cooler was designed to handle. Cars that pull campers or work trucks are common situations where the factory cooler just doesn't provide adequate heat transfer to keep the transmission cool enough. In those situations, the answer is usually simple enough: add an auxiliary cooler to the system. 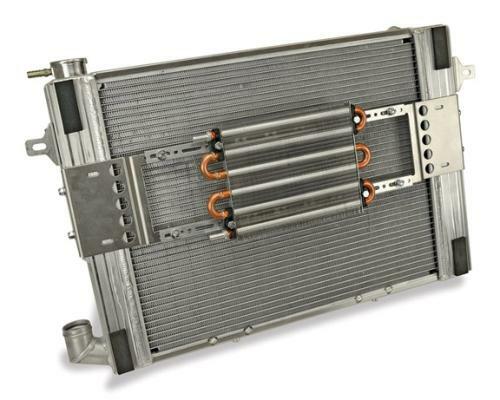 These are generally small heat exchangers that replace the factory coolers. They usually mount in front of the radiator, and transfer heat from the transmission fluid directly to the ambient air passing over their fins. Your local Cottman center technicians can examine your car or truck, and let you know whether an auxiliary transmission cooler would be a worthwhile investment to help protect your automatic transmission. And, if you decide to have one installed, they can take care of finding one with the right capacity, and installing it on your car or truck. There's nothing more deadly to your automatic transmission than heat. But your friends at your nearby Cottman center can help you protect your transmission against heat damage, to keep your transmission operating for years to come.